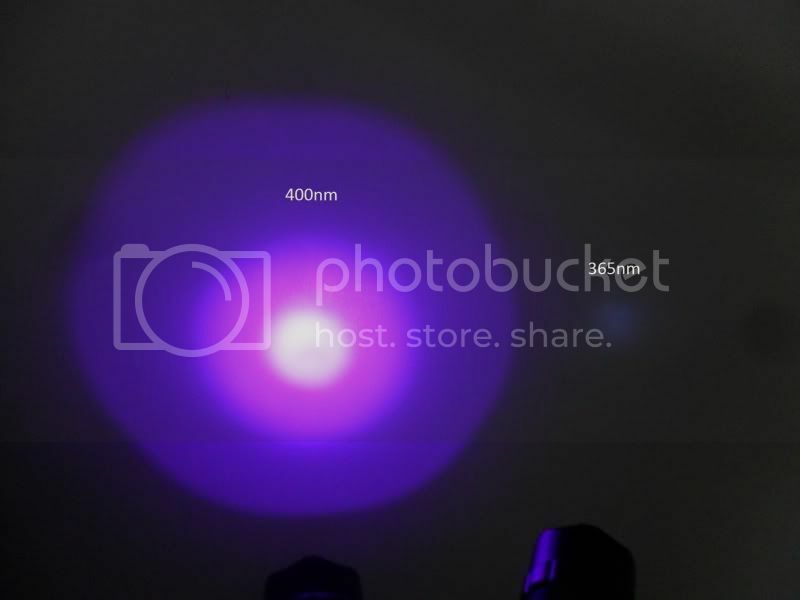 Does anyone know any site that sells real UV flashlights? DX has lots of them but AFAIK they're all near 400nm, I'm looking for something near 365nm "blacklight". I'd rather have an LED one but fluorescent will do if LEDs aren't available. This one is between 365 - 370nm, and to be Gallium Indium Nitride LEDs with this wavelength, is not too expensive. There are other more expensive options around. And also significantly cheaper, arround $ 10, flashlights using fluorescent tubes of 6". However, it needs 2x16340s, not 4V like they say. ^^ I have the same flashlight, but I not have advise of it, because I don't know if it was exactly 365 nm or near. Now is confirmed they are. @piferal: Looks good but would cost almot 50 w/ shipping. @Cyparagon: That's it, perfect! They quote the output as 3 lm (which is obviously low because it's UV), do you know the mW output? mine consumes (including the driver) 340mA at 4V, which is 1.36 W total (with this voltage). I think it may be about 1W of power, or a little less. But is speculation, watching what consumes in total. You might not have 365nm, piferal. The markings on the side are for the case only. The drop-in can be different. I have two lights with the same markings, and are otherwise identical, but one is 400nm and one is 365nm. The major difference between the two is brightness. I put the 365nm one against my power meter and got ~30mW. But the area of the sensor is only half the area of the output of the light, so I estimate 60mW of optical power. Well, ofcourse I can not swear that one of mine is 365nm, without checking with a spectrometer, and you're far away to check my flashlight, but I'm pretty sure it is. On the left of the photo my 395nm, and on the right the which I believe is 365nm. Now I have not time, but tomorrow I will try to take photos of the emitters of the 2 flashlights. Although just for fun, here are the photos of the emitters. Guess thats good enough to tell these two apart even if you have no idea which one you have by just looking at the emitter. If you have some experience with UV lights it will not be hard to tell 395nm from 365nm by just looking at how bright the light appears, and how bright fluorescense from certain objects is. 365 nm really is almost invisible to the eye, whereas 395 led lights usually show a disctinctive purple output. Longwave UV flashlights are good for showing scorpions, certain dyes..etc. If you are after shortwave (minerals), you'll most certainly be wanting a Hg Vapour arc lamp. Diodes that output hard (265nm) UV are limited to 300mW and cost upwards of $350EA. I'm not sure how anyone else perceives the color, but you could try looking at them through a diffraction grating. The 365 sill produces some light in the violet range (and indeed, some in the whole visible spectrum)Without a grating, it is more difficult to tell the difference in color. 400nm is a definite violet. To me, as this shifts to 365nm, it starts to look like a pale blue or maybe a greyish indigo? It's hard to describe. It is certainly not the same color though. 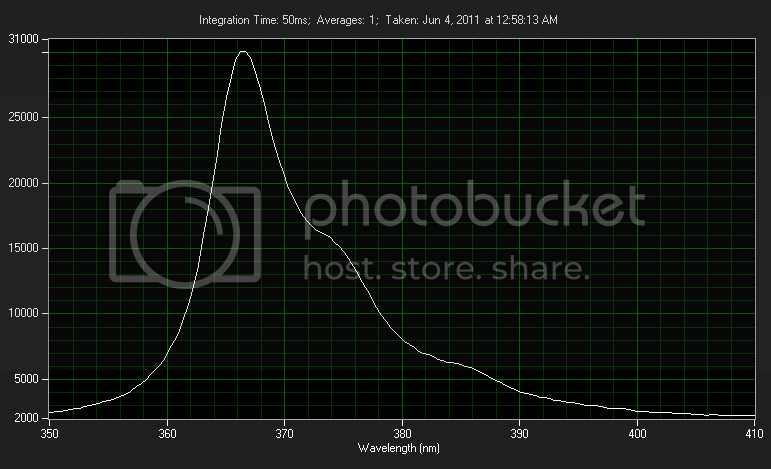 Not like IR where everything 650nm and up looks the same. Now that you mentioned I used to collect minerals when I was younger and I still have a bunch. Any chance some will fluoresce with 365? @Cyparagon: A prism should do the trick, right? Some minerals will Fluoresce well, others won't. Got some Autunite? That glows extremely well under 365nm. Other minerals like Scheelite require "harder" UV (254nm). Some minerals will change colour depending if they're under long or short wave UV. I have been collecting minerals since I was 5/6 y.o. and have an extensive collection of both long and shortwave minerals.